SVB - Submarine battery-monitoring ans surveillance system. The SVB is a submarine battery-monitoring and surveillance system, which allows you to have information on the overall status of the submarine’s batteries and all the submarine’s individual components available at all times. Controlling the battery operating parameters is key to increasing battery life. Periodic measurement and acquisition of the operating parameters. Monitoring of data processing and battery status. Response to requests for information and prediction of evolution. Safety from design to operation in battery chambers. 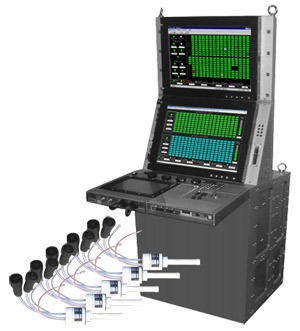 The system can be installed on any type of diesel submarine, either integrated with the Platform Control System, or in stand-alone mode, with a dedicated console. It adapts to different battery configurations, in both layout and number of constituent elements. Experience in submarine battery control. The submarines of both the Spanish and the Chilean Navy use this submarine battery monitoring and surveillance system. We can also configurate it for installation as a tool for maintenance tasks during check-ups, repairs, onshore battery activation and for large hulls. Provides operator assistance for controlling and monitoring the submarine battery. It monitors how much electrical energy is available, evaluating the autonomy of discharge and the duration of residual charge. Indicates whether each accumulator remains within the nominal operating range.